For a downloadable PDF version of the user manual, click here. StarGenetics is a customizable genetics experiment simulator that allows students to study how traits are inherited. StarGenetics simulates mating experiments between organisms that are genetically different across a range of traits. In StarGenetics, students can design, perform and analyze the results of genetics experiments involving model organisms such as fruit flies, yeast and Mendel’s pea plants, and non-model organisms such as cows, fish, and “smiley faces”, the latter of which was designed for a younger audience. StarGenetics runs on standard Linux, Windows and Mac computers. To get to StarGenetics, navigate to: http://star.mit.edu/genetics/. Click on the Start button to download the application. Open the file you have downloaded. Depending on your browser, click Trust, Run, or Allow when a prompt appears asking if you trust the signature or certificate, or if you allow StarGenetics to access your computer. To open a file that comes bundled with StarGenetics: click File-->New in the toolbar, and select the exercise of choice. To open a file that does not come bundled with StarGenetics: click File -->Open in the toolbar, and navigate to the location where the exercise of choice is saved on your computer. To save your entire set of experiments that can be reopened at a later time, click File -->Save. Enter a name for the file and choose a location in which to save the file, then click Save. Your experiments will be saved as a StarGenetics file (.sg1). When the file is re-opened, all of your saved experiments will appear in the Saved experiments window and you can continue to create new experiments. Click on Help -->Send Suggestions to provide feedback, suggestions, or report software bugs. Enter the information then click Send Report to submit your comments. You can also send suggestions by clicking in the Suggestion Box at the top left of the page once an experiment is open. Click Help -->Getting Started to access a basic “Quick Start” guide with instructions for how to mate organisms and save experiments. To perform experiments with all organisms, EXLUDING YEAST, you can follow the same basic steps and the user interfaces look very similar. To perform experiments with yeast, see the Working With Yeast section of this User Guide. 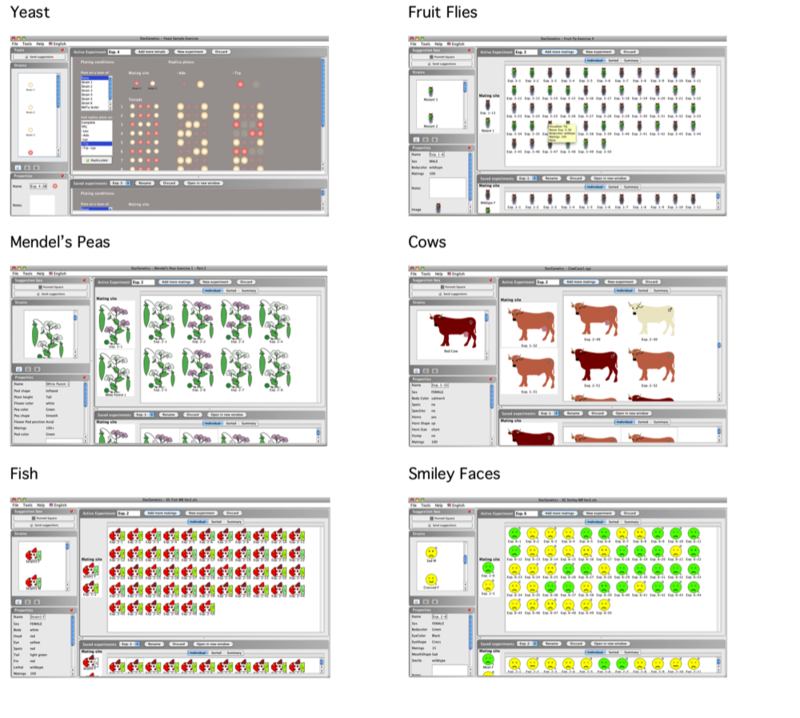 The following instructions use screenshots of the program in the Fruit Fly visualizer, but the same icons can be found in the same places in the Peas, Cows, Fish and Smiley Face visualizers. The Punnett Square tool helps you determine the genotype of a particular organism after performing a genetic cross. The Punnett Square tool allows you to determine the expected genotypic distribution of the progeny given the genotypes of the parents. Click on the Punnett Square button in the Suggestion box. The genotypic frequencies for the cross are summarized at the bottom of the tool. The Strains box contains all of the strains provided to you for the exercise. You can click on any strain in the Strains box and examine its phenotypes and other properties in the Properties box. 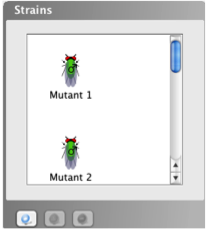 To add progeny generated from a cross to the Strains box for easy access, simply drag an organism into the Strains box or click on an organism and select the Add to strains icon . To remove a strain from the Strains box, click on the strain and then click on the Remove icon at the bottom right of the Strains box. Note: you can only remove strains that YOU have added to the Strains box, and not strains provided to you by the instructor. The Properties box contains a written description of a strain’s phenotype. To examine the properties of an organism, click on any organism in the Strains box, Active Experiment, or Saved Experiments windows. The Properties box contains: the name of the organism, its phenotype with respect to a variety of properties or features, the TOTAL number of times this organism can be used in a mating (listed as matings), a place for you to enter your own notes about the organism, and a small picture of the organism. 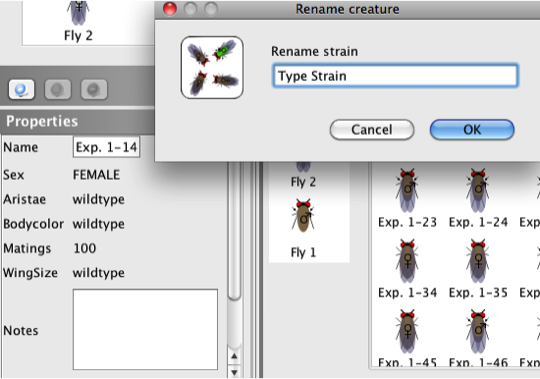 You can rename a strain by clicking on the existing organism name in the Properties box, typing in the new name, and clicking OK to confirm the name. To minimize the Properties box and increase the size of the Strains box, click the minimize icon in the top right corner of the Properties box. The Active Experiment window shows the current experiment in progress. It contains two parts: the Mating site and the experimental results. The experimental results are divided into three viewing modes: Individual, Sorted, or Summary modes. See Tab Views for more information. The Saved experiments window displays the results of previously saved experiments. The saved experiments can be accessed in the Saved experiments window, by selecting the desired experiment from the dropdown menu. The saved experiment can be viewed in a separate window by clicking Open in new window. Once an experiment is saved to the Saved experiments window, you cannot change the experiment. You can only view results that have been previously generated when the experiment was in the Active Experiment window and cannot add more progeny to the experiment. You can use the progeny generated from a saved experiment by dragging the desired organism from the Individual or Sorted tab in the Saved experiments window to the Mating site in the Active Experiment window. Alternatively, you can select an organism in the Saved experiments window and click the Add to strains icon at the bottom of the Strains box or drag the organism from the Saved experiments window to the Strains box. The first step in crossing two organisms or strains together is moving the strains you wish to cross to the Mating site. 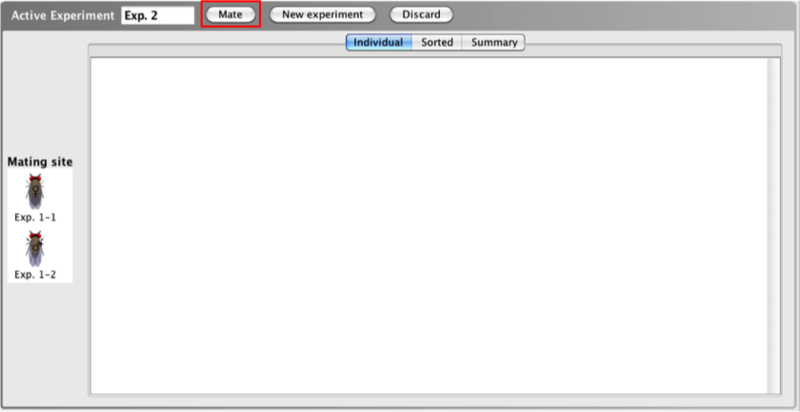 Once you have selected the two organisms you would like to cross, click the Mate button (B) at the top of the Active Experiment window. A certain number of progeny are generated from a cross after first hitting the Mate button, but you can add additional progeny to the cross to increase the total progeny generated. To add additional matings, click Add more matings (B) at the top of the Active Experiment window and select the number of matings you would like to perform. The Mate button is replaced by the Add more matings button after a mating is performed. The number of additional progeny generated in EACH mating is equal to the number of progeny generated in the initial mating. These additional progeny will be displayed along with the previous progeny in the Active Experiment window. 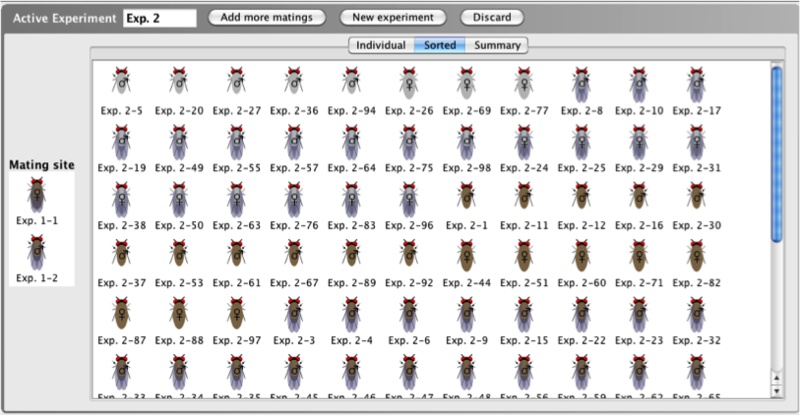 For example, if you generated 20 flies after initially hitting the Mate button, and you perform an additional 5 matings, you will generate an additional 5x20=100 flies for a total of 120 flies. You can continue to add additional progeny by clicking the Add more matings. Each time, you will have the option of choosing the number of additional matings to perform. Note: You will not be able to generate additional progeny in a cross once a parent’s maximum number of matings is exhausted. The number of matings remaining for any organism can be seen in the Properties box of that organism under the 'Matings'heading (see the Properties Box above for more information). 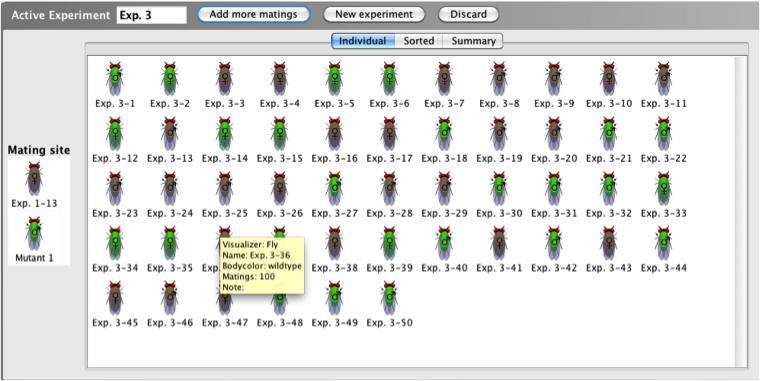 Your individual mating experiments will be automatically saved for you when you start a new mating experiment by clicking New Experiment (C). The saved experiments can be accessed in the Saved experiments window, by selecting the desired experiment from the dropdown menu (H). The saved experiment can be viewed in a separate window by clicking Open in new window (K). The Active Experiment window is now ready to perform another cross. 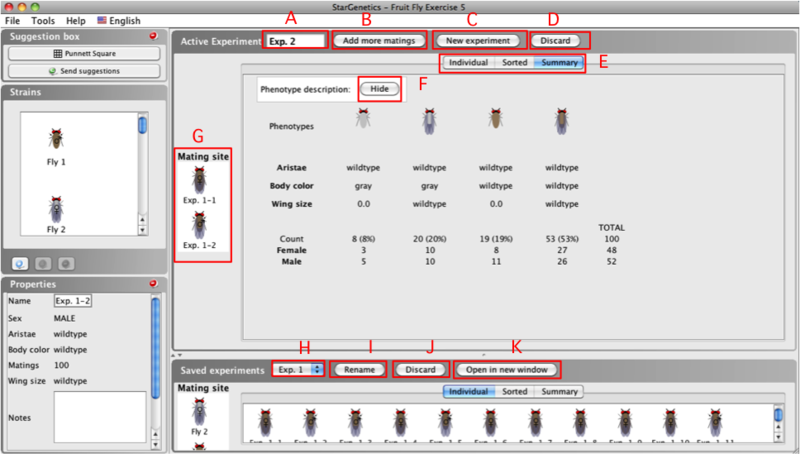 To rename an active mating experiment, click on the box containing the name of the active experiment (A) at the top left corner of the Active Experiment window. Type a new name for the experiment, then click OK.
To rename a mating experiment that has already been saved in the Saved experiments window, select the experiment you wish to rename from the dropdown menu (H), then click Rename (I) in the Saved experiments window. Type a new name for the experiment, then click OK.
To rename an organism (for example, an individual plant or fly for use in later crosses), click on the organism in the Strains box or the Individual or Sorted view in either the Active Experiment window or Saved experiments window. Click on the existing name of the organism in the Properties box (Exp. 1-14, in the example below). Type the new name in the pop-up window and click OK.
To discard an active experiment, click Discard (D) at the top right of the Active Experiment window. When asked to confirm that you would like to discard the experiment, click OK. Your experiment will be discarded and a new experiment will open automatically. To discard a saved experiment, select the desired saved experiment from the drop down menu in the Saved experiments window, and click Discard (J) at the top of the Saved experiments window. Click OK when prompted to confirm that you would like to discard the experiment. 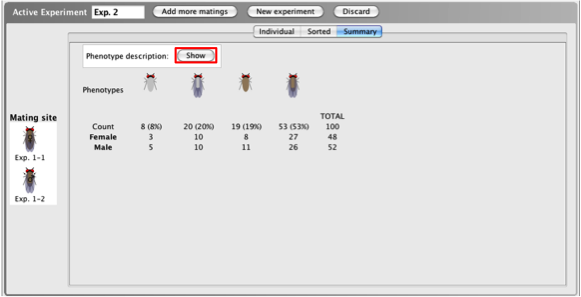 After generating progeny by performing a mating experiment in StarGenetics, you can analyze the phenotypes of the resulting progeny in one of 3 tab views in the Active Experiment or Saved experiments windows: the Individual tab, the Sorted tab, and the Summary tab (E). When viewing progeny in the Individual view, all individual resulting progeny of a cross are listed in the order they were generated. There is no grouping with respect to gender or phenotype. The Individual tab includes the name of each organism generated in a cross and a thumbnail image of each organism. For a written description of each organism and its phenotype, click on the organism and refer to the Properties box. When viewing progeny in the Sorted tab, the individual resulting progeny are sorted by gender and phenotype (for example aristae length and body color), so that all of the progeny that have the same phenotype are clustered together. The Sorted tab includes the name of each organism generated in the cross and a thumbnail image of each. When viewing progeny of a cross in the Summary tab, a summary of the results of the mating is provided. The Summary tab tallies the number of progeny in each phenotypic class, giving you the frequency (percent) of progeny within each phenotypic class, a numeric breakdown of males and females within each phenotypic class, and the total number of progeny produced. Click the Show button beside Phenotype description to view a written description of the phenotype(s) of each class. Click the Hide button beside Phenotype description to hide the written phenotypic descriptions. In the Mendel’s Peas visualizer, users are able to self-cross a strain of pea plants in addition to crossing two different plants together. In pea plants, each plant produces flowers with both male and female reproductive organs. This means that a single plant can act as both the sperm and ovum donor. To perform a self-cross with pea plants, simply drag the same plant to the Mating site TWICE to act as both the sperm and ovum donor. Note: you are not able to perform self-crosses with the other StarGenetics organisms (flies, fish, cows). A unique feature of the Fruit Fly and Fish visualizers is the ability to look at hereditary transmission of RFLPs (Restriction Fragment Length Polymorphisms) in the form of virtual electrophoresis gels. In RFLP analysis, DNA is digested by one or more restriction enzymes, and the resulting fragments are separated through the process of electrophoresis on an agarose gel. If two DNA samples have different sequences, they may exhibit different patterns of DNA fragements on the gel if their sequences differ within the restriction site or in the distance between restriction enzyme sites. If different alleles of a gene produce different RFLPs, then RFLP analysis can be used to deduce the alleles of a gene in a given individual. By examining the RFLPs of different phenotypic classes, students have the ability to correlate genetic information with the phenotypic information of the progeny flies as well as associate phenotypic traits with physical locations (markers) on chromosomes. When an experiment has RFLP data compatibility, the tabs will be labeled: Individual, Sorted, Trait Summary, and DNA Marker Summary (the Summary tab is divided into trait and DNA summaries) within the Active and Saved experiment windows. To show the RFLP analysis, click on the DNA Marker Summary (A) tab. 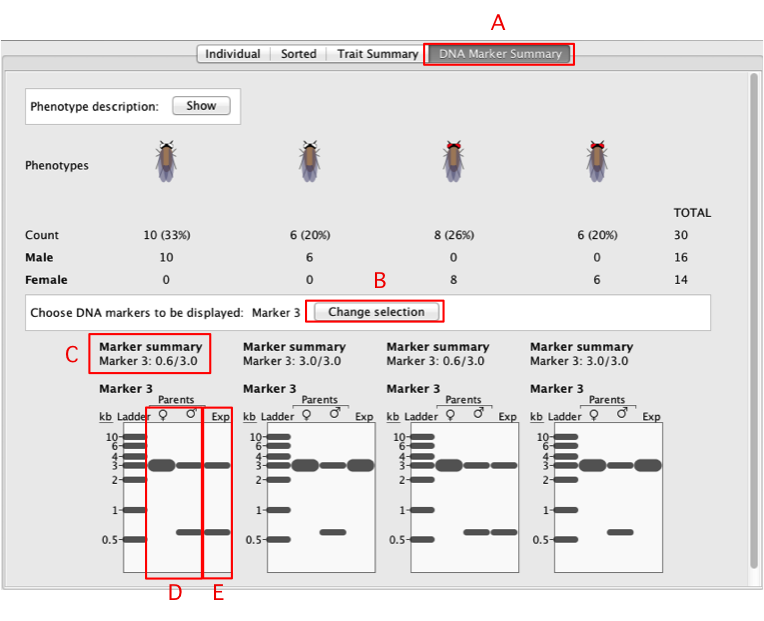 Choose DNA marker(s) to be displayed – each marker is a different RFLP site. You can select multiple markers at once, or Display None to display no markers. Click Apply. You will see an electrophoresis gel underneath each phenotypic class. On the gel, you will see a ladder with reference markers of varying sizes, the RFLP pattern of the female and male parents (D), and the representative RFLP pattern for each phenotypic class (E). In each lane, each distinct band represents an RFLP allele. For each phenotypic class, the size of the RFLPs in kilobases (kb) is summarized under the Marker summary section (C). The sizes of the RFLPs of the alleles are separated by a "/’". To change the RFLP markers included on the gel, click the Change selection (B) button and select other DNA markers as explained above. Some aspects of the user interface in the yeast visualizer are the same as described above. This includes the basic layout of the yeast visualizer: the Strains box, Properties box, and some features of the Active and Saved experiments windows (excluding tab views). The same procedures can be used to open a new experiment, save experiments, rename experiments or organisms, and discard experiments, as described above. After opening a file in the yeast visualizer, you must choose whether to perform a tetrad experiment or a non-tetrad experiment by clicking on the appropriate buttons. The layout of the active experiments window is different depending on the type of experiment, either tetrad or non-tetrad, chosen in the yeast visualizer. In this section of the user guide, the layout of each type of yeast experiment will be explored and examples of each will be provided. Use a non-tetrad experiment to test individual yeast strains or a group of multiple yeast strains for growth in various selective media conditions (different amino acid components of the media or temperatures) without the analysis of tetrads. Non-tetrad experiments may also involve mating yeast strains together by replica plating one strain on a lawn of a different strain to create diploids, but these diploids cannot sporulate into tetrads in non-tetrad experiments. Tetrad experiments involve mating two strains of yeast together and sporulation the resulting diploid for tetrad analysis. The resulting tetrads are then replica plated onto lawn and/or selective media conditions to deduce information about each tetrad’s genotype and mating type. Use a tetrad experiment to study recombination in yeast as each tetrad shows each of the 4 meiotic haploid products. The first step in a non-tetrad experiment is selecting the strain(s) you wish to study by moving them to theActive Experimentwindow. 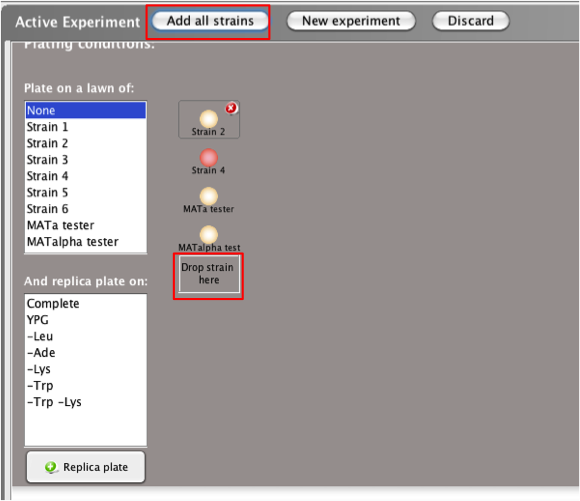 To remove a strain from the Active Experiment window, click on in the upper right corner of the image of the strain. 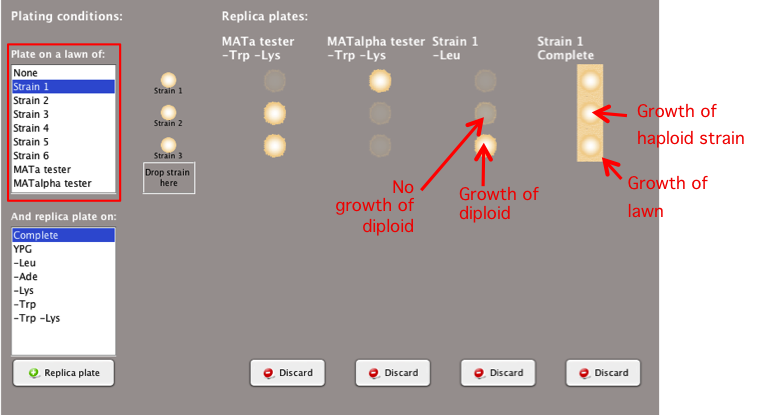 To determine if a strain can mate and form diploids with another yeast strain, replica plate one strain onto a lawn of a different yeast strain. Select the strain you wish to use as a lawn in the 'Plate on a lawn of:'box. You can select multiple lawns at the same time by holding the Control key (or command key on an Apple computer) and selecting different strains to use as a lawn. Note: To produce accurate experimental results, you must make sure to choose appropriate media conditions to ensure that only the resulting diploid, and not the parent haploid strains, can grow. Using lawns can be especially useful to determine the mating type (MATa or MATalpha) of each strain and whether mutant yeast strains can complement each other (whether they have mutations in the same gene or different genes). Replica plating yeast strains on different selective media can provide information about their genotypes, such as which amino acids cannot be synthesized by certain strains. 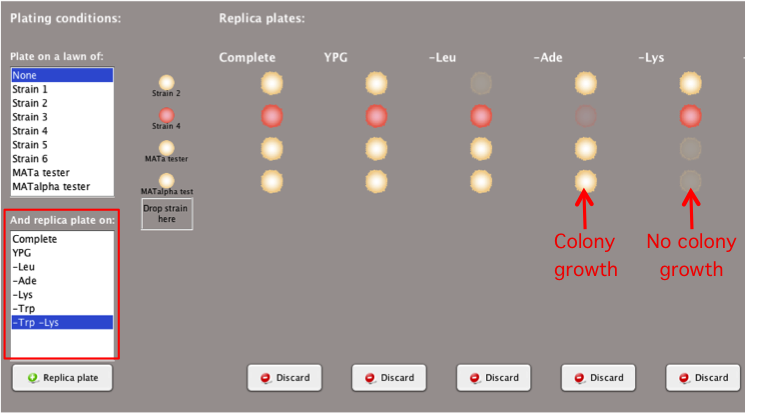 Select the desired conditions in the 'And replica plate on:'box. You can select multiple media conditions at the same time by holding the Control key (or the command key ( on an Apple computer) and selecting different media conditions. Different temperature conditions may also be available in this box for various media. If a strain cannot grow in a media condition lacking an amino acid, then it will be represented by a shadow of the replica-plated colony. Replica plating involves inoculating a secondary plate containing selective growth media with yeast colonies from a primary, or master, plate. This reproduces the pattern of colonies on the plate, so growth of a yeast strain can compared between multiple conditions. Click the Replica plate button to observe the experimental results of growing the yeast strain(s) on the selected media and lawn conditions. You can continue to add new media conditions by selecting additional media and/or lawn conditions and clicking the Replica Plate button. You can continue to add additional replica plates even after you have saved your experiment by clicking the Replica plate button in the Saved experiments window. To discard a particular replica plate within your Active Experiment window, click the Discard button below the relevant column(s). The first step in a tetrad experiment is adding the strains you wish to mate to the Mating site. Drag and drop the yeast strain from the Strains box to the Active Experiment window to the box labeled "Drop here to mate"
When you mate two haploid yeast strains in a tetrad experiment, first a diploid yeast cell is created and then the diploid cell undergoes meiosis, producing a tetrad with 4 spores. Once you have selected the two strains you would like to mate, click the Mate & sporulate button at the top of the Active Experiment window. A number of tetrads will be generated. Each tetrad contains 4 spores; each spore is one of the resulting meiotic products. 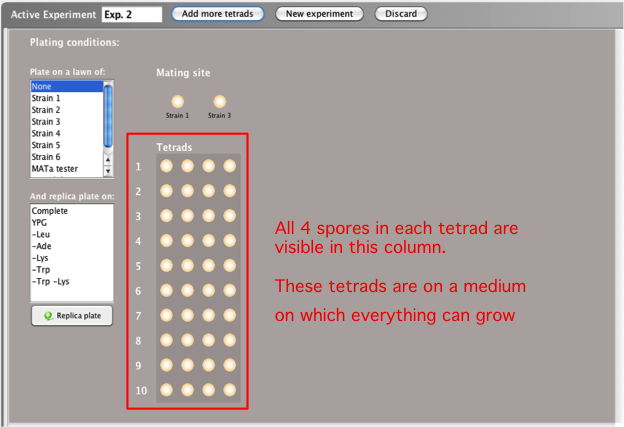 The images of the tetrads that appear on the left side of the Active Experiment window after clicking the Mate & sporulate button represent growth of each spore on complete, non-selective media, as in the picture below. Each tetrad, comprised of its four spores, is a row. You can then replica plate the spores onto selective media and/or lawns. You can increase the number of tetrads you wish to analyze by adding more tetrads to a mating. 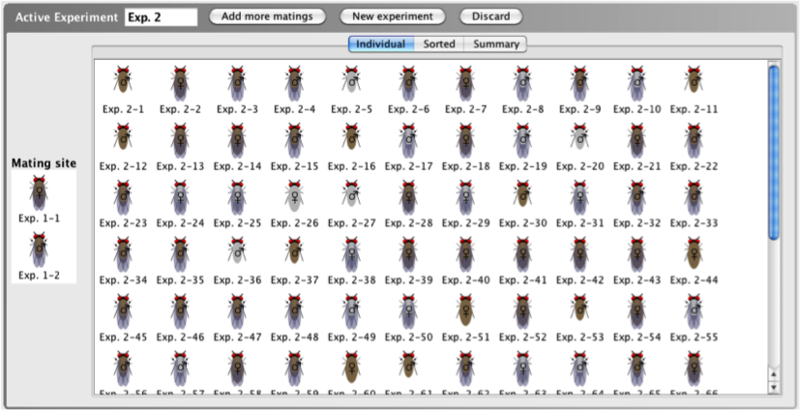 To add more tetrads once the Mate & Sporulate button has been selected, click the Add more tetrads button, at the top of the Active Experiment window (this button takes the place of the Mate & sporulate button). Select the number of tetrads you would like to add and click OK. Note: Once you have saved your experiment to the Saved experiments window, you will no longer be able to add more tetrads to the experiment. To determine if a spore from a tetrad can mate and form diploids with another yeast strain, you can replica plate one strain onto a lawn of a different yeast strain. Using lawns can be especially useful to determine the mating type (MATa or MATalpha) of each spore and whether mutant spores can complement each other (whether they have mutations in the same gene or different genes). The tetrad type (NPD, PD, TT) classifications are not applicable when the tetrads are replica plated on lawns. In this case, a summary of the tetrad types is not provided. Replica plating the spores of a tetrad on different selective media can provide information about the spores’ genotypes. You can use this to infer meiotic recombination rates (see Analyzing Tetrads). You can select multiple media conditions at the same time by holding the Control key (or the command key on an Apple computer) and selecting different media conditions. If a spore cannot grow in a particular media condition, then it will be represented by a shadow of the replica-plated spore. 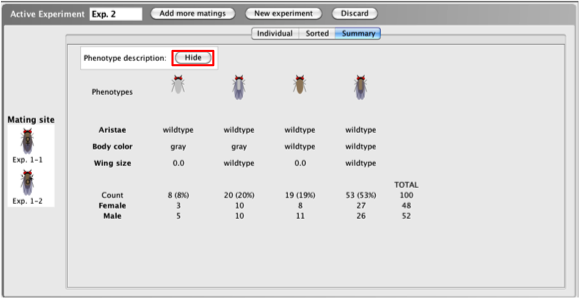 To discard the entire experiment, click the Discard button in the tool bar of the Active Experiment window (see information about discarding experiments in the fruit fly visualizer). Based on the numbers of spores that grow within a tetrad, tetrads can be classified as parental ditypes (PD), non-parental ditypes (NPD), or tetratypes (TT). The numbers and ratios of each of these tetrad types can be used to infer recombination rates and map distance between genes. There is a summary at the bottom of the column of tetrads that counts the different 'tetrad types' – the number of tetrads in which zero, one, two, three, and four spores grow are tallied individually. Only the types of tetrads resulting from your experiment are included in the summary. It will be up to you to classify each 'tetrad type' as a parental ditype, non-parental ditype and tetratype. 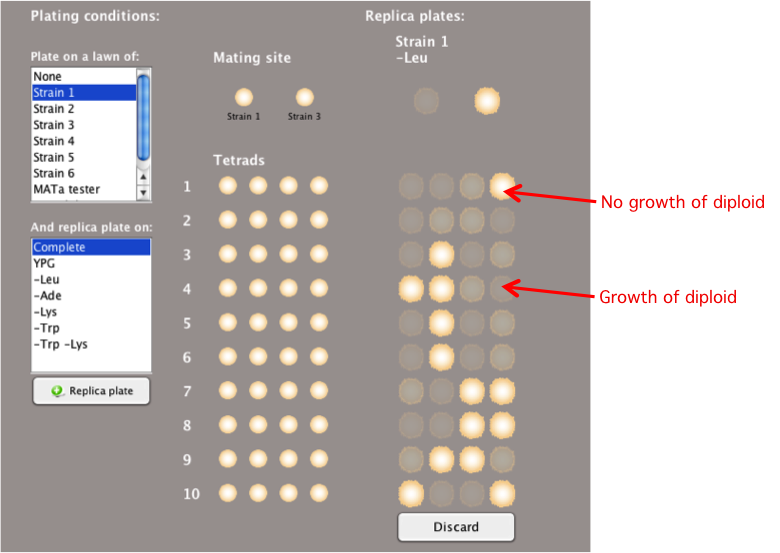 After StarGenetics generates more than 100 tetrads, it resorts to a summary-only mode, in which the number of each tetrad type is listed and the individual tetrads are not visible, by default. To display the images of the individual tetrads, click on the Display Individual Tetrads button. The location of the spores that grow when replica plated on selective media may be different in different tetrads. This is because StarGenetics accurately models the variation that exists in experiments. 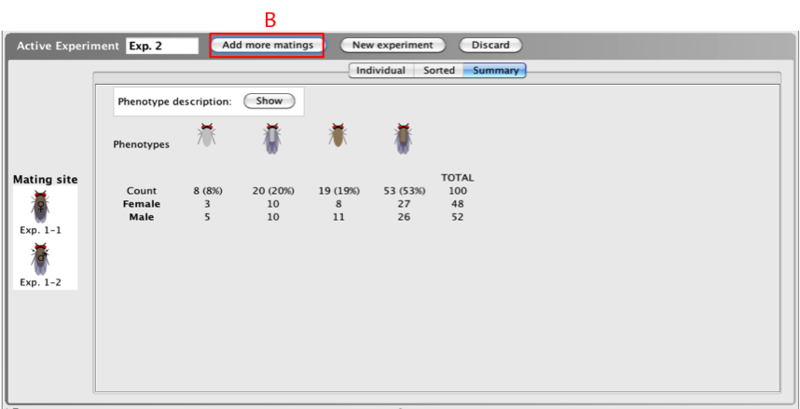 To use a spore from a mating as a strain in another experiment, start a new experiment by clicking New Experiment, and drag the desired spore from the Saved experiments window to the mating site. You can add a particular spore from a tetrad to the Strains box for future use by dragging that spore to the Strains box or by selecting the spore and clicking the Add to strains icon . Note: you must drag the spore from the original tetrad (in the left most column under the Tetrads heading), not the spore from a replica plate experiment, to use it as a parent or add it to the Strains box.